I have four cats – Hermione, Barclay, Piper, and George. I love my cats – but on occasion they can drive me insane. One of the primary ways they encourage insanity is by whining when they want food and ripping into Charity and I’s food when they are hungry. We used to leave food out all the time for them – but Barclay has an eating disorder of some sort. She will continue eating as long there is food, puke, then repeat (forever). She gained tons of weight – I think at her heaviest she was 25 lbs. She was going to die (from diabetes or etc. ), we were spending unnecessary amounts on cat food, and cleaning up vomit is not my idea of fun…so we began rationing the food, giving them portions in the morning and evening. But sometimes they aren’t happy with this, or think we should feed them at a different time, and sometimes they want more food – especially Barclay. This means they break into our food – rice, crackers, cereal. Sometimes they knock over the trash can – all forms of disasters can occur when they feel they need more food. Recently they broke into a bag of cat food I accidentally left out. I moved it into the pantry and a few days later noticed something interesting – the cats weren’t begging for food. What had happened? Well, with the bag ripped the cats where able to stick their paw under the pantry door and pull out pieces of food and keep themselves sated. It was easy enough that Hermione, Piper, and George could do it whenever they were hungry and difficult enough that Barclay wouldn’t keep eating forever. I wanted to replicate this experience. One option I found (and have been very happy with thus far) is the PetSafe SlimCat Interactive Toy and Food Dispenser. It is a plastic ball with holes cut into it. By sliding the plastic around you can make either the smaller or larger holes open. The top pops off and one can fill the toy with cat food. As the cats knock it around the floor a few pieces come out here and there. In this way the cats have to work for their food (we still give them regular servings as well) and also can’t get too much all at once. 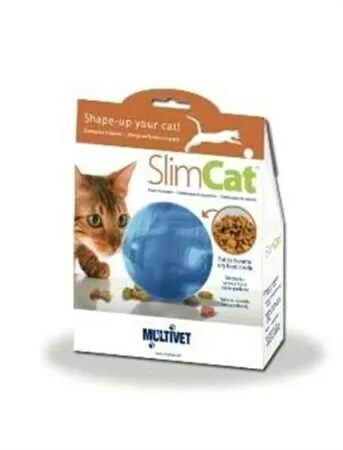 I see it as a reasonable solution for anyone who has an eating disordered cat – especially in a multi-cat household. Next story Surviving the Darkness: A Crash Course in Muddling Through Anxiety, Depression, and So On.